For many kids, going to the dentist can be a scary experience (it's scary for many adults, too!). Taking a dentist-phobic child to the dentist can be a hassle and emotionally exhausting for you. Dentist phobias are surprisingly common; in fact, nearly one in 25 people, both adults and children, are dental-phobic. However, getting your kid the dental care they need shouldn't have to be such a nightmare. Here are a few tips for helping your kids overcome fear of the dentist. If you're trying to avoid future problems with getting your children to the dentist, the easiest way to avoid dentist phobias is to start taking them to the dentist early. This will help them get used to the process of a dentist visit while also making sure their teeth stay healthy from the very beginning. The healthier their teeth are, the easier dentist appointments will be, and easier appointments and visits mean less stress for your child. Baby teeth start growing in around six-months, so children should begin regular dental visits at age one. The way you talk about the dentist can have a huge impact on how your child sees their experience. Be careful with words that might worry your child, like "shot," "hurt," "pain," and so on. These words are inherently negative, and while they are sometimes part of going to the dentist, they're more likely to make your child nervous about their upcoming visit. Being careful how you handle language around the visit can help keep your child calm. While phobias can be hard to make sense of, understanding that you can trust your dentist can help keep your anxiety in check. Despite our dental-phobia, dentistry is actually considered one of the ten most trusted professions in the United States. Remind your child that your dentist knows what they're doing and they're here to help. 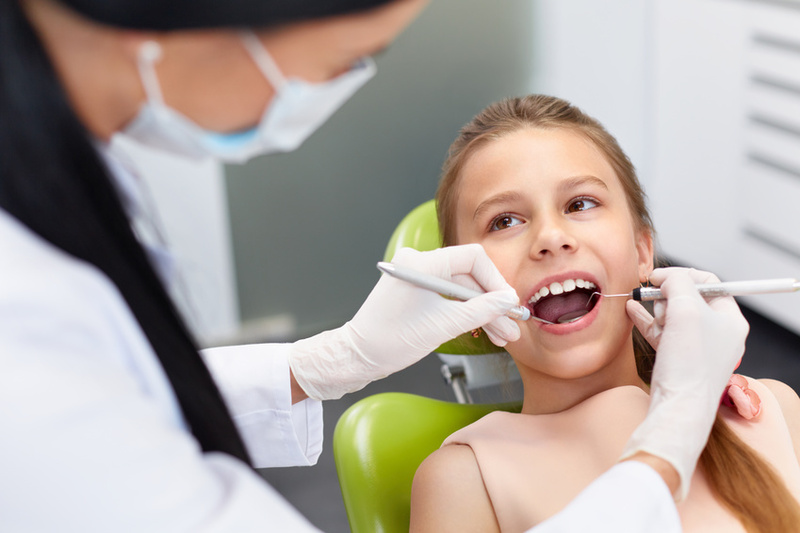 One of the reasons children can be nervous around dentists is because they're essentially a stranger; reassuring your child that their dentist wants to help them can put their mind at ease. If you have some anxiety yourself about going to the dentist, it's important to remember how your child will react to that. Children model behavior that they see from the adults in their lives that they trust, so if you're scared of going to the dentist, they'll be scared too. Being anxious or phobic about going to the dentist is understandable, but managing your own fear will help your child stay calm the next time they have an appointment. Having your child see their parent tackle the dentist without fear will help them realize there's nothing to be afraid of, making it easier to take them to the dentist when you need to. Finally, don't underestimate the importance of the right dentist. While there are many family dental clinics, individual providers will vary in their ability to naturally put kids at ease. If your dentist isn't getting along well with your children, or you, for that matter, don't be afraid to find a new dentist. Ask other parents in your social circle for recommendations; they may know the perfect dentist for your family. Getting your child to the dentist when they're anxious about their visit can be a challenge, but using these tips can help. Have you gotten you or your child over a dental phobia? What worked for you?